Ready for a fun day under the sunshine on those shimmering Cabo seas? For over 13 years, Cabo Expeditions has been creating unforgettable vacation memories for thousands of visitors. Committed to providing exciting and educational experiences highlighting the beauty and majesty of Cabo’s pristine marine environment, the team of Cabo Expeditions offers a friendly English-speaking staff with vast knowledge about the Sea of Cortez and extensive safety training to make your outing one to remember. A variety of tours offer the right mix of fun, learning, challenge and safety on the awe-inspiring waters of Los Cabos, from whale watching to snuba. 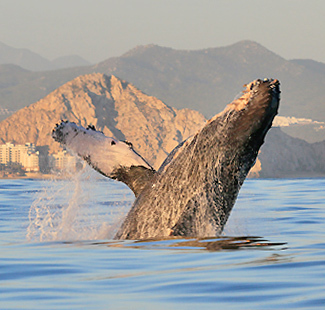 Observe and learn about the magnificent humpbacks, grey, blue and sperm whales that visit Los Cabos each year. A trained naturalist will help you discover these gentle and fascinating giants of the deep. Includes round trip transportation, certified guide, soft drinks and bottled water. Experience the magical sounds of humpback whales on this unique Cabo adventure. 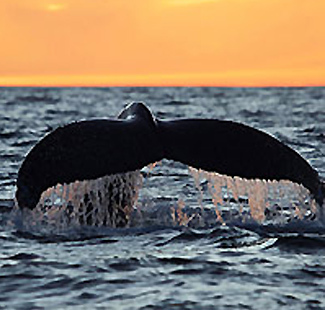 We start with a sunset cruise in the beautiful waters of Cabo San Lucas to watch the whales of Baja. During this excursion, a hydrophone is dropped in the water to pick up the poignant songs of humpbacks whales who have migrated to the warm waters of Baja to mate. The humpback story is more than meets the eye; humpbacks are renowned for their complex songs that can be heard underwater. It’s a thrill to suddenly see a huge dark torpedo thrust out of the sea, waving the long white flippers unique to this species, and smack the water with a spectacular splash. This is an unforgettable experience. On a clear night, stars off Cabo San Lucas glisten like diamonds in the night sky over the Sea of Cortez and the Pacific Ocean. Includes round trip transportation, certified guide, wine, cheese, meat & fruit platter, soft drinks and bottled water. Please Bring: Comfortable clothing and a jacket or sweater for the boat ride. Requirements & Restrictions: Minimum age is 5. Anyone under 18 must be accompanied by an adult. This tour is not for guests who are pregnant, have heart, back and/or nose problems. No one under the influence of alcohol or drugs is allowed on the tour. Depending on weather and wind conditions, the ride can be bumpy. Maximum is ten guests per boat, multiple boats available. Board a Zodiac boat for an unforgettable excursion to Santa Maria and Chileno Bays where you’ll experience the tropical marine life of the Sea of Cortez. Includes round trip transportation, equipment, tour guide, light lunch, water and soft drinks. 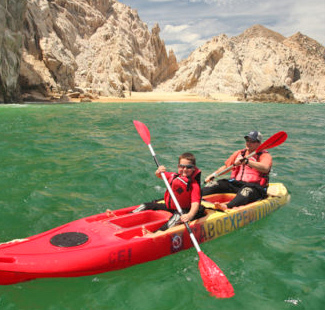 You’ll explore the beauty of the Sea of Cortez on your 2-person clear-bottom kayak. Follow your guide past Lover’s Beach, the famous Arch and the sea lion colony. Finish up with delicious treats. Includes equipment, tour guide, water and \soft drinks. Round trip transportation is available for $10/person. Stay dry in a semi-submersible underwater adventure with front-seat views of the marine life of the Sea of Cortez. Enhance your knowledge as our marine biologist guide shares interesting tidbits about Baja California, marine life and natural history. Includes certified guide, use of fish identification cards during tour and bottled water. Round trip transportation is available for $10/person. Note: Minimum 10 persons to run tour. Maximum 33 people. Anyone under 18 must be accompanied by an adult. Snuba provides the ease of snorkeling with the ability to breathe underwater without the usual scuba equipment. Discover beautiful tropical fish. Includes equipment, tour guide, water and soft drinks. Round trip transportation is available for $7/person. Immerse yourself in an authentic Baja experience. Our expert guides will lead you to this natural sanctuary. You’ll swim with the tropical sea life, have the opportunity to kayak, snuba, dive or swim and enjoy local cuisine. Includes round trip transportation, certified guide, snorkel equipment, breakfast, lunch, soft drinks and bottled water. *Note: individuals/couples participating alone will be grouped together to provide the 4 person minimum. Swim with the Whale Sharks Expedition! A once-in-a-lifetime experience awaits! 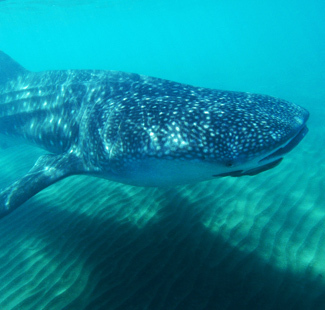 Here is your chance to swim with whale sharks, the gentle giants of the deep. We'll pick you up in Los Cabos where we'll head out to the La Paz area to board boats, accompanied by experienced guides. Don't miss this opportunity to experience the amazing feeling of snorkeling with these magnificent animals. Includes transportation, lunch, drinks, wetsuits and snorkel equipment. *NOTE: Whale Shark Tours are seasonal and depend upon presence of whale sharks due to water currents, etc. Prices are per person; tax included. Tours include bottled water and soft drinks. Child pricing for ages 5-10 years. $10/person transportation service is paid directly to the vendor. Private Tours include round-trip transportation, bottled water, and equipment/gear. You will check-in at the Cabo Expeditions reservation office located next to the Tesoro Resort, inside the parking lot. The office is right next to Dairy Queen and Tanga Tanga.